Daniel Craig will play James Bond for a second time, with a new film set to be released in May 2008, producers say. The actor, who was chosen to replace Pierce Brosnan in the 007 role last year, has faced criticism from some fans for having blond hair. But Bond producer Barbara Broccoli praised him for "portraying, with emotional complexity, a darker and edgier 007". 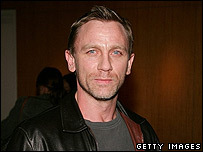 Craig, 38, will make his Bond debut in Casino Royale, due out in November. He is the sixth actor to play the British secret agent after Sean Connery, George Lazenby, Roger Moore, Timothy Dalton and Pierce Brosnan. Bond girl Caterina Murino, who stars in Casino Royale, previously said Craig had been upset by criticism of his selection for the role but insisted that he would win over fans. "This James Bond doesn't look like a little cartoon like before, like the last one or so charming and playful like the first James Bond. This is new," she said. Craig was born in Chester and grew up in Liverpool. He studied drama at the Guildhall School of Music and Drama in London, and got his breakthrough role as hard man Geordie Peacock in the TV series Our Friends in the North. He has since starred in several Hollywood films, including Lara Croft: Tomb Raider, Road To Perdition and Stephen Spielberg's thriller, Munich.